On Thursday, April 26th, several of our men will enter the gates of Ridgeland Correctional Institution for a Kairos weekend. The mission of Kairos is to share the transforming love and forgiveness of Jesus to those incarcerated. We can help the team going in several ways. One of the easiest and most appreciated is by baking cookies! Check with Bob Keane for the recipe or click here. Cookies need to be brought to church on Sunday, April 22nd. You can also sign up for the prayer chain. Every hour of the weekend there will be somebody praying for the inmates as well as the Kairos volunteers. The men make a paper chain and show it to the inmates to demonstrate how many people are praying for them. And lastly, as you can imagine, each weekend costs between $3,000 - $5,000! So you can also make financial donations through Bob or here. You’re invited to HHI/ Bluffton Young Life Family Camp April 27-29, 2018. Imagine spending the weekend with your family, away from the busyness of life, at Young Life’s Windy Gap camp nestled in the mountains just outside of Asheville, NC. You and your family are in for a treat! Windy Gap has so much to offer. You can play some Frisbee golf, jump in the massive hot tub, hit the wiffle ball field, or just enjoy a weekend in the mountains. For some relaxation, you might just enjoy sitting in the rocking chairs soaking in the view. Whatever you choose to do, it is sure to be an adventure and one of the best weekends of the year! You can access a registration form below. Cost is $125 per adult, $75 for ages 3-11, and free for under 3. Register soon as spaces go quickly! 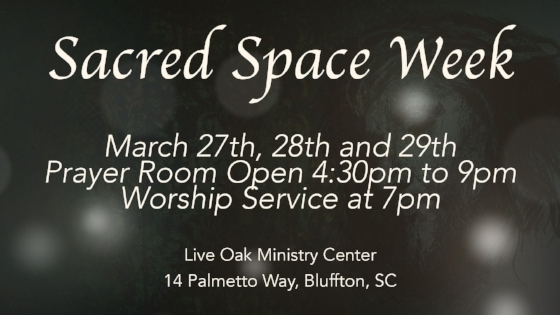 Join us at the Ministry Center March 27-29 for prayer and worship leading up to Easter. Be sure to stop by the Connection Cafe this Sunday to pick up some invitations for Easter. Invite your friends, neighbors, and co-workers to a great service! Easter services will be held on Saturday, March 31 at 5:00 & 7:00pm and Sunday, April 1 at 9:00 & 10:45am. Child care will be available at all of the services.